Rendering of a proposed soccer stadium by Rafael Viñoly Architects. Two real estate giants are joining forces in hopes of bringing a professional soccer stadium to the Port Morris waterfront, along with 550 new apartments, according to New York Yimby. A day later, Crain’s reported on a competing proposal by an established developer of affordable housing in the Bronx, calling for 2,000 apartments, a medical facility, a charter school, retail space and a publicly accessible waterfront area. 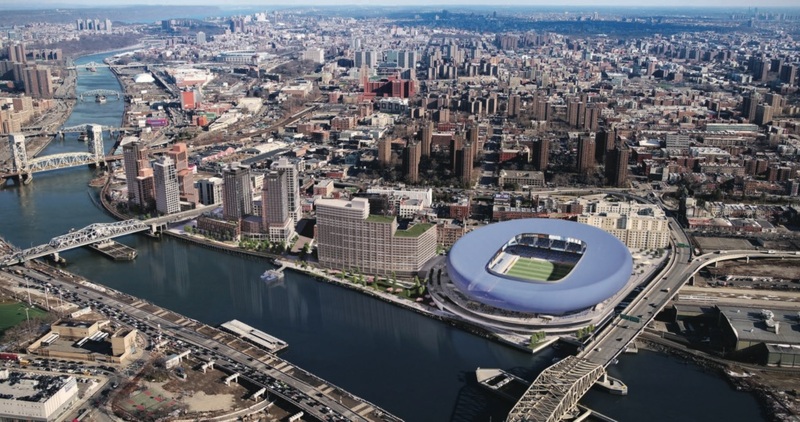 The first proposal comes from a team consisting of the New York City Football Club, the Related Companies and Somerset Partners, who estimate the project would cost $700 million. 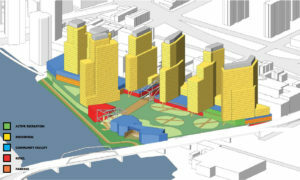 The second proposal, by L+M Development Partners Inc. and Omni New York, would be in close proximity to another project already in the works by the developer, called Bronx Point, where hundreds of apartments would line a proposed waterfront esplanade, along with a much-anticipated hip-hop museum. The Empire State Development Corp., which promotes economic growth through tax incentives and marketing, issued Requests for Proposals in 2016 to develop on a triangle of barren land on a 12.8-acre parcel of the state-owned Harlem River Yard, which spans a stretch between the Third Avenue and Willis Avenue bridges. But some residents are alarmed by the scope of both of the new proposals. They and an elected official say it’s critical that the community is consulted before any next steps are taken. The industrial area that surrounds the vacant parcel is dotted with power plants and overrun with commercial truck traffic, and has long been dubbed “Asthma Alley.” Eight percent of Bronx children suffer from asthma, according to the city’s health department, double the rest of the city, and advocates have long complained that the South Bronx is the epicenter of the borough’s epidemic. Environmentalists also worry that traffic generated by a huge new waterfront housing and commercial complex would not only worsen health problems, it would also put residents at risk of flooding. 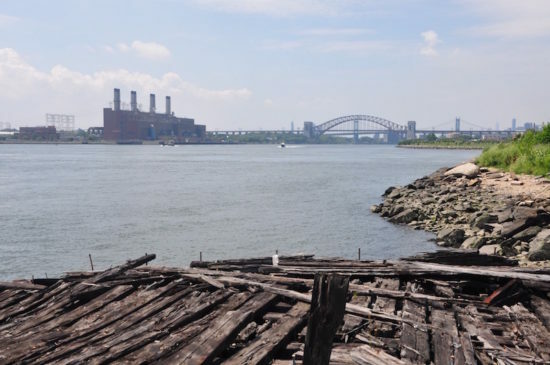 Annel Hernandez, associate director of the NYC Environmental Justice Alliance, said that the city should avoid overbuilding on low-lying waterfront areas and instead create natural buffers against flooding. The question of whether the waterfront parcel should be developed at all is a valid one, said Lopez. Councilwoman Ayala said she worries about how the developers will define affordability if either of the two projects under consideration move forward. The Bronx’s median household income is $35,302, according to recent data from the U.S. Census Bureau, far lower than that the rest of the city. If the soccer stadium proposal passes, it would be the first of its kind in the city, and would be designed by internationally-renowned Rafael Viñoly Architects. The layout includes a 25,000-square-foot medical facility, a waterfront park and 150,000 square feet of retail space, along with the 550 units of affordable housing, according to New York YIMBY. Somerset owned the adjacent parcel but recently sold it to another developer. High-rises with more than 1,200 market rate apartments, along with retail, a community facility, a park and a riverfront esplanade are planned for the parcel within two years. This isn’t the first time developers have tried to find a home for a new soccer stadium in the Bronx. In 2013, the owners of NYCFC and former Mayor Bloomberg nearly reached an agreement to build a $350 million soccer stadium near Yankee Stadium, but opposition by then Mayor-Elect Bill de Blasio cut the deal short. Port Morris would be the sixth proposed location since 2011 in the club’s search for a permanent home. A rendering of the L+M/Omni plan. Harlem River Yard is governed by a General Project Plan, which would allow the state to bypass the city’s public review process and determine its own zoning regulations for the parcel. 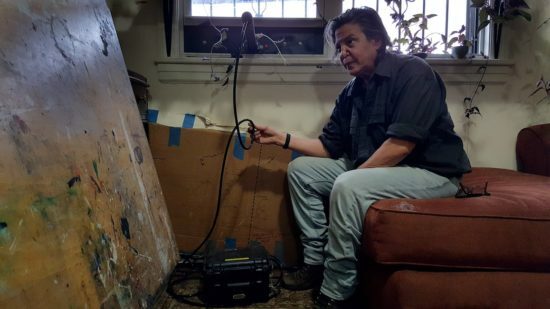 Mychal Johnson, co-founder of grassroots advocacy group South Bronx Unite, said he suspects that officials will fail to adequately publicize any plans for the waterfront to keep residents in the dark. The Empire State Development Corp. did not immediately answer questions from The Herald about when it will announce a decision.